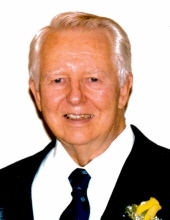 Edward W. Gorecki, 90, passed away peacefully on October 25, 2018. He leaves behind his wife of 66 years, Rose "Dot"; his sister Shirlee; children Roseann (William), Bennett, Matthew (fiancée LuAnn), and Stephanie (Robert); 6 grandchildren, Andrew, Joel (Melissa), Michelle, Justin, Mallory, and Vanessa; and great-granddaughter, Avery. He was preceded in death by his parents, Ben and Helen; and his brother Raymond (late Dolores). Ed served in the US Navy from 1946 to 1948, and later graduated from the University of Illinois. He loved fishing, travel, classical music, building clocks, and dancing the jitterbug, polka, and cha cha with Dot. Ed also was a member of the Loyal Order of the Moose. Visitation 3-8:00 pm, Monday, October 29, 2018 at Glueckert Funeral Home, 1520 N. Arlington Heights Rd. (4 blocks south of Palatine Rd. ), Arlington Heights, IL 60004. Prayers 9:15 am, Tuesday, October 30, 2018 at the funeral home proceeding to St. Alphonsus Liguori Catholic Church, 411 N. Wheeling Road, Prospect Heights, IL 60070 for a 10:00 am Funeral Mass. Interment is at All Saints Cemetery, Des Plaines. In lieu of flowers, memorial contributions may be given to The Salvation Army, www.salvationarmyusa.org, St Joseph Indian School, www.stjo.org, or St. Alphonsus Liguori Catholic Church, https://saintalphonsusph.org. "Email Address" would like to share the life celebration of Edward W. Gorecki. Click on the "link" to go to share a favorite memory or leave a condolence message for the family.